One of my main aims in taking this Landscape Photography course has been to enable me to take better advantage of the photographic opportunities I have through travel for my work. But also within the constraints that my professional duties present. These constraints mean that I currently have little opportunity to do serious documentary work, or take heavyweight equipment that is capable of producing large format gallery work. I also do not have the printing equipment to learn to produce high quality prints. Producing a portfolio of work that can be done during the many journeys and also in snatched moments around trainings, to show what could be done without significantly increasing the work and travel budget could enable me to negotiate a bit of extra time – or identify what I might self-fund. Photobooks – together with on-line slideshows – is a possible area where I could get some extra funding in future as part of work contracts. The series of images of Kyrgyzstan that I have used for the four books presented here were part of my attempt to record, understand and communicate what I saw on a 9-hour journey from Bishkek through one of the poorest and most remote areas, and photos taken early morning, midday and evening around my training workshops once I arrived in a village called Baizakh. I focus mainly on Photobooks, exploring different ways of selecting, processing and presenting the images – considering different interpretations for different audiences and types of Photobook to be published on Blurb. I looked at other on demand publishing options (See Post Photobooks: design and publishing). But decided on the basis of cost and flexibility to use Lightroom and Blurb – the Blurb software itself requires all images to be uploaded before thinking about layout. I prefer to be able to do the two things together. The main limitation of Lightroom is the text editor which is not at all user friendly – lacking the styles and generic editing capacity of full book layout software like InDesign. It is however much quicker if text is limited – but influenced my decision to limit text on all the books. I looked at different colour and black and white styles that I might adapt (See Post Photobooks: Inspiration). Books I particularly liked were the fractured images of Lee Friedlander, the dark contrasty work of Daido Moriyama, and very sensitive black and white of Atget and also some Lithuanian photobooks I have. In addition to the books, I uploaded the images to rudimentary galleries with automated on-line slideshows on a SMUGMUG website I am slowly developing as a professional site for all my art and photography work: http://www.zemniimages.com/Photography/Documentary/Kyrgyzstan . As my first attempts at Photobooks I am quite pleased with the results. 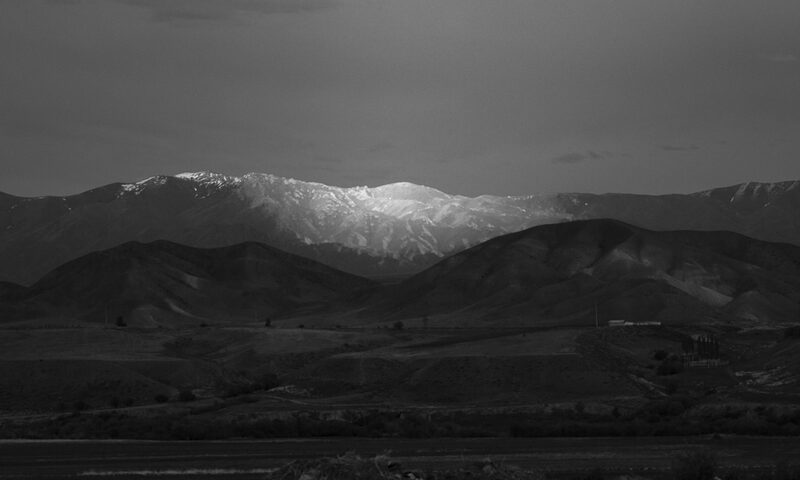 In Journey to Naryn I quite enjoy the abstract patterns the images make and the feeling of the journey. I think that the two books on Baizakh capture the feel of the village in their different ways. The colour book I think is probably most as I remember it – the colours were very striking – the greys of the mist at dawn, the greens and light through the trees, and the reds and purples of sunset. The black and white book of Baizakh makes the place seem older and nostalgic – but maybe that is a bit of a stereotype in the context of the Soviet black and white photographic tradition. I was mostly struck by the drama of some of the images of the sunsets that I thought would only look good in colour. My favourite of the four is Storm Clouds over T’ian Shen. The images are darker in the book than on screen (maybe also because of the cheaper paper? my monitor is regularly calibrated). It does give the feel of desolation of the journey – the huge empty spaces and the ever-present pylons for the hydro-electric industry alongside the very poor travelling community. If I had had more information about the journey and the village, I would probably have added one or two pages at the beginning or end. But none of these places were on the Internet – even the road is not clearly marked. And the people I was travelling with were based in Bishkek and also had very little reliable information. My first attempt at a Photobook was an extension of my work on journeys. I experiment with the many different layout options in the Lightroom Book Module, aiming to enhance the feel of being on a journey. Part of the work is influenced by the images of Lee Friedlander using various framing devices, and including the driver (eg illegally using a mobile phone and cracked windscreen!!) and varying horizontal with vertical spreads, single and multiple images to vary the rhythm of the journey. I limited the text to one page inside (I should have changed the colour of the map to dark grey or blue). The second book was also in colour but showing images I had taken of the village and spectacular surroundings I enjoyed, particularly early morning and evening, but also the heat of midday. There was not time for me to do an informed social documentary. The images are very much those of an outsider. But as well as the beauty I attempt to show some of the contradictions – the bottles littering the mountain, the emptiness of the streets (I never discovered why that was) and the drama of the storm. Again I experiment with different layouts, and reorder the images to tell a narrative. The text is limited to section titles and the cover. For page spreads see the post: Baizakh in Colour. I then started to experiment with Black and White using Lightroom and also Silver FX Pro. I found that some of the images that looked good in colour looked even more dramatic in black and white – for example the sunsets, as well as the moody interiors. For this book I used a very simple one photo per page layout, and tried printing in high quality paper. Text is limited to the cover – this is common in Black and White Photobooks as the reader then focuses on the content of the images. For page spreads see the post: Baizakh in Black and White. This fourth book I wanted to make very different – again in black and white, but influenced by the very contrasty and haunting books of Daido Moriyama, particularly Tales of Tono. I followed the order of images from the journey, with one image per page on a black background. But matching images for example the horizon lines, tone and general mood. Again there is no text, I chose just a simple explanation of the title on the back cover. I chose the cheapest paper and a soft cover to increase the feeling of menace and also the sense of ‘being on the road’. For page spreads see the post: Storm Clouds over T’ian Shen. For more details of this book and page layout see the full post: Storm Clouds over T’ian Shen. But I got 40% off – it is worth waiting for these offers!